Most people know that the Fourth of July – Independence Day – is a celebration of America’s separation from Great Britain. July 4th, 1776 marks the beginning of the United States. It’s like our national birthday. With the celebration just a few days away, here are four important facts about Independence Day that every American should know. Fact One: The 4th of July is the wrong day. The reality is that not much happened on Thursday, July 4, 1776. The real “fireworks,” so to speak, happened two days earlier on July 2nd. It was on the 2nd that the Continental Congress wrapped up its debate on the question of Independency (that’s what they called it back then) and finally voted 12-1 (New York abstaining) in favor of separation from Great Britain. So technically, the decision for Independence was made on the 2nd of July. John Adams, who championed the cause, wrote to his beloved Abigail that July 2nd would go down as “the greatest day in American history, celebrated with fireworks and parades for generations to come.” I’m paraphrasing, but you get the idea. In honor of John Adams and American Independence, I set off fireworks and have my own parade on the 2nd of July each year. My Homeowners’ Association doesn’t approve. Fact Two: Jefferson Didn’t Write The Declaration …. Alone. Thomas Jefferson was part of a committee tasked with drafting an official statement on Independence. Adams, the head of the committee, appointed Jefferson to draft a statement because Jefferson was thought to be the best writer in the group, was well liked, and was from Virginia (so Independence wouldn’t look merely like a regional, New England movement). Jefferson spent two weeks penning the Declaration, borrowing heavily from John Locke and other sources. When the draft was complete, Franklin and Adams (both on the committee) made changes before Jefferson submitted it to the Continental Congress on June 28. The famous Trumball painting (above) in the US Capitol most likely depicts this event, not July 4th. Once submitted, the Declaration sat on a desk, largely ignored until the Big Vote on the 2nd, after which it was debated and edited for two days by all the members of the Congress. 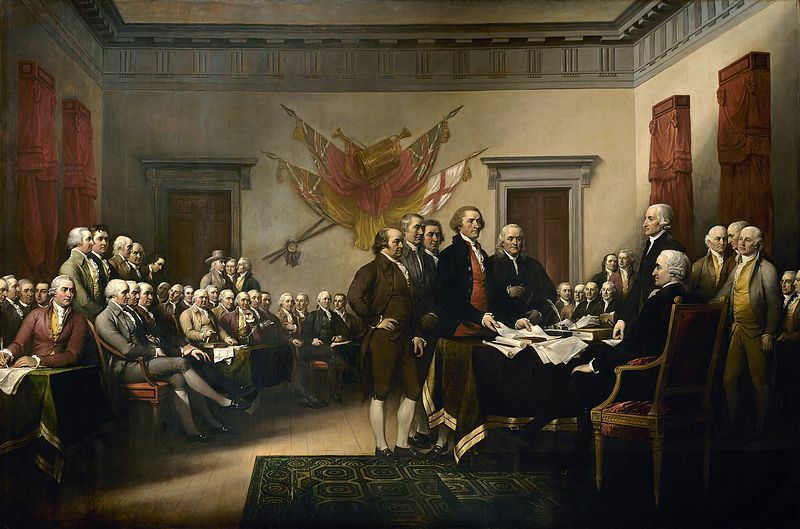 Early in the day on the 4th of July the Congress voted to approve the document. They set it aside and went about their other business. Fact Three: The Declaration was Not Signed on the 4th of July – Everybody recognizes the signature of John Hancock, President of the Congress. Supposedly he signed his John Hancock so large that even “blind old King George” could read it. Hancock’s signature, and probably his secretary, were the only two people to actually sign the document on the 4th of July. After it was approved by the Congress, and signed by Hancock to affirm that approval, it was sent to a local printer for a rush job. These early printed copies were distributed by express rider. George Washington received one and had it read aloud to his troops. If you find one of these original Dunlop broadsides (named after the printer and the printing technique) hidden in an old picture frame, you can retire. There are only about 25 known copies in existence and they’re worth a small fortune. So what about the signatures on the big fancy copy of the Declaration? The big velum copy in the National Archives was ordered up on July 19th. It was not printed off a press but hand scribed, probably by the Congressional clerk. It was on this later version that the famous document was titled the “Unanimous Declaration of The Thirteen United States of America.” The earlier copies lacked this title while New York was making up its mind. Most historians agree that this fancy copy was signed on August 2, 1776. This conclusion is bolstered by the Congressional Record and the fact that some of the names on the document weren’t present in Congress on July 4th, obviously making it impossible for them to have signed then. Some men even missed the August signing and added their names a few months later. Rather than a singular event, the signing process was really more of a leisurely collection of signatures when people were in town. Fact Four: There was no “Independence Day” until 1870 The first celebration of Independence occurred in 1777. On July 2nd of that year the Congress decided they should do something to commemorate the first anniversary of the big event. Being the 2nd already, it was a little late for planning. They decided to do something on the 4th – the day the Declaration was adopted – and so began the tradition. In addition, July 2nd was a Wednesday while the 4th was a Friday, and I’m sure a three day weekend sounded just as good to the Founding Fathers as it does to us today. Many states adopted their own regional celebrations over the years, but Independence Day didn’t become an official national holiday until 1870, a few years after the Civil War. So why do we celebrate the wrong day? The need for understanding our roots is as timeless as the human story itself. We like origin stories. We might even call them myths. We like being able to pinpoint “the place and time where it all began.” It’s the same fascination that draws us to visit our childhood home even though we don’t remember living in it. This helps explain our fixation on the Declaration of Independence. Though the decision for Independence was made on the 2nd, the birth announcement didn’t come until two days later. We cling to the Declaration because it gives us roots and legitimacy and stands as our national birth certificate – signed by all 56 of our fathers. And so the 4th of July, rather than the 2nd, becomes the day we commemorate the birth of the United States. Thomas Jefferson gets all the credit while John Adams get pushed out of the celebration. Ironically, without Adams, Independence and the Declaration itself might never have happened. Happy 239th Birthday America! I’ll be at the party on the 4th to celebrate Jefferson and the Declaration, but I’ll get started two days earlier with a toast to John Adams and American Independence. Hi Chris! Thank you for this”new to me” information. We have guests coming for the holiday weekend and this will be shared around our table. I hope all is well with you and your family. Greetings from the Texas Hill Country, where my husband and I moved last fall. Good lesson and well done. Happy Birthday to our great country! Be careful where you aim those roman candles on your July 2 neighborhood independence day! As someone born on the 2nd of July, I appreciate you setting the record straight. Thanks, Chris. Very interesting….just as all your presentations are. I really enjoy reading your posts. They are thoughtful, well written, entertaining and I usually learn something. Thanks!